Review of roof structures for handling alternative energy systems. We can determine cause and origin of failed structures and materials. See brief tech note on Foundations (MSWord or html) and insect damage (MSWord or html). 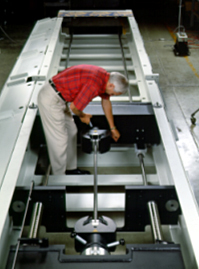 V. Popp Inc. designed an automatic drawbridge with electric lift for mezzanines at GT Solar's manufacturing plant. Left photo shows bridge fully closed. Right photo shows bridge half opened during construction. This 3 DOF motion base was used for ocean wave simulation but it did not meet the clients specifications. VPOPP Inc. was responsible for overseeing the engineering analysis which led to the system improvements which led to successful performance. Project managed by V. Popp included two high-stiffness fabricated steel frames. Provided to NASA for pulling apart aerospace panels. Large vacuum chamber and 1500 deg. 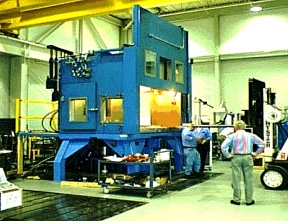 C furnace was integrated as part of V. Popp's responsibility. 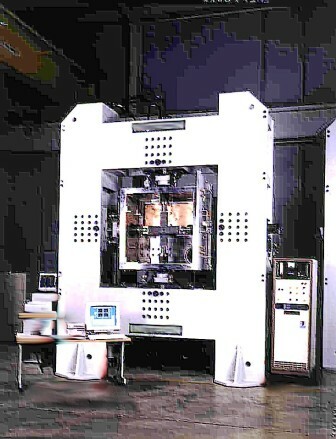 Project included steel frame to react high static and dynamic loads. All frame resonances designed for 25 Hz minimum. Large heating/cooling chamber was also integrated. Foundation damage due to frost heaving. Remedial action recommended. Ridge sagging due to powder post beetle damage of rafters. This roof truss failed, pushing out the second story wall, and condeming the building. Cause of failure and stabilization method specified by VPOPP. Inspections, repairs, renovations, and failure analysis. Stamped engineering reports to meet Code. V. Popp designed the mechanical and hydraulic components for this closed-loop, 3-D, Hydraulic Motion Base (virtual reality ride). Frame deflections and resonances were critical. This steel frame breaks 3/4 inch thick steel cables up to 30 feet long.